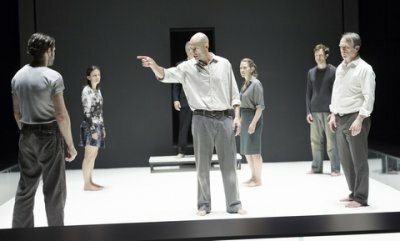 Belgian–born director Ivo van Hove has brought his London Young Vic revival of Arthur Miller’s A View from the Bridge to Broadway in a production so stripped down to its essentials that it seem to reinvent theater as well as this play. The minimalist director already known in NYC for his seven stagings at the New York Theater Workshop (including The Little Foxes and Scenes from a Marriage) and his five at Brooklyn Academy of Music (including Angels in America and Antigone) has reduced the cast list from 15 to eight, eliminated scenery and props, has the actors go barefoot, and has washed out almost all color from the stage. The result once the plot is wound up has hypnotic power that is rarely seen in our theater. The cast led by British stage star Mark Strong as protagonist Eddie Carbone includes five of the actors from the London production, as well as British stage and screen star Russell Tovey. Miller’s play (seen here in its fourth Broadway revival) takes place in Red Hook, Brooklyn, among the Sicilian community. Longshoreman Eddie Carbone, a good man, has brought up his wife’s orphaned niece Catherine and been an excellent stepfather. However, like the tragic flaw in Greek tragedy, he has developed an unacknowledged passion for his 17-year-old niece who is just on the verge of becoming a woman. His wife Beatrice is troubled by the fact that he is so possessive of her that he doesn’t want her to take a local job. When his wife’s cousins, the married Marco and the single Rodolfo, illegal immigrants who have jumped ship from Italy in order to work in America, arrive to stay with them for some time, Eddie’s jealousy suddenly knows no bounds. When Catherine and the blond-haired Rodolfo are attracted to each other, Eddie’s paranoia becomes uncontrolled and he sets out to humiliate Rodolfo in Catherine’s eyes before the relationship can go too far. When Eddie is told by the local lawyer Alfieri that there is nothing he can do other than report them to immigration, the stakes are set for a Greek-style tragedy, and the play gains pace as it moves towards its inevitable catastrophe. Among the production’s innovations, audience members sit on stage on either side of the square playing area which suggests a boxing ring, a cage or an arena. Designed by long-time van Hove associate Jan Versweyveld, the playing area is a white floor surrounded by a glass bench on three sides. The back wall is charcoal grey (like most of An D’Huys’ costumes worn through the evening) and contains a single doorway for entrances and exits. Versweyveld’s lighting rivets attention on this unadorned playing area. No props are used and actors appear before their scenes begin so that there isn’t a moment of wasted time. As the cast does not change costumes and the scenes segue into each other, there is the feeling that all the events take place on one day, fulfilling Aristotle’s unities of time, place and action. The magnificent soundscape by Tom Gibbons begins Steve Reich’s “Drumming” at the moment halfway through the play when Eddie is told there is nothing he can do and causes the tension to mount almost unendurably from that moment on until the tragic final moments. As in Greek tragedy, we know that the ending is inevitable from here on. Gibbons also includes choral singing which sounds like a requiem mass, heightening the tension as well as the drama. 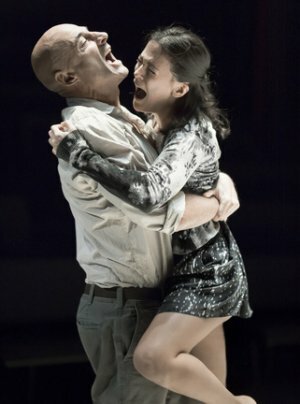 Although A View from the Bridge is one of Miller’s most produced plays, van Hove’s version makes you feel that you have never seen the play before. Performed without an intermission, the text reduced to eight actors is pure and lean, without a single unnecessary word. Van Hove uses the horrified Alfieri as a Greek chorus who tells us the story that we witness sometime after the events have occurred and he is on stage throughout. 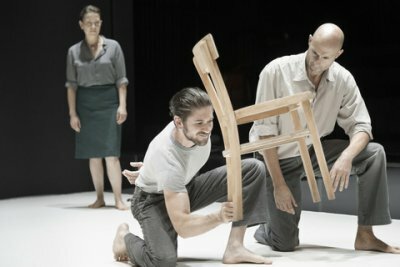 In other productions, Alfieri seems like an intrusive and weak device, but here he is our eyes and ears into the story – and the play’s moral conscience. The cast is barefoot throughout except for Alfieri suggesting a performance by ancient Greeks or a communal ritual. When Alfieri joins the action near the end, he also removes his shoes. The play begins in silence with longshoreman Eddie and Louis (Richard Hansell) toweling off after showers and ends with purifying blood, bookending the play with two of the main elements in life. Although the play was written and set in 1955, the timeless, nondescript costumes suggest the events could be taking place today. The Italian accents of the Sicilian cousins have been eliminated and so all the characters sound the same. The casting is superb and each actor’s presence is palpably felt. As the inarticulate Eddie Carbone, Mark Strong, the tallest person on stage, is powerful communicating his violent emotions without ever actually stating them. He paces the stage like a caged animal – valid as his unacknowledged passion is tearing him apart. As his understanding wife Beatrice, Nicola Walker (seen on the three seasons of PBS’s Last Tango in Halifax) is also a strong presence even though she can’t confront her husband with her knowledge. As the 17-year-old Catherine just about to come of age, Phoebe Fox captures all the confusion and discontent of an adolescent about to blossom into womanhood. Dressed in a print blouse (the only color on stage) and a very short miniskirt, she looks as though she has suddenly outgrown her clothes. Watch as she initially greets Eddie by jumping into his arms and locking her legs around him, the behavior of an innocent child with no thought of sexual feelings, a behavior that she will later regret. Michael Gould, a more emotional Alfieri than usual, demonstrates his wry, jaded view of the world before revealing his horror at the tragedy that he knows is coming. Tovey, best known here for both the stage and screen versions of Alan Bennett’s The History Boys and HBO’s series Looking, is a very convincingly masculine Rodolfo, the blonde Italian whom Eddie would like to believe is homosexual. As his older brother Marco, Michael Zegen (one of two American actors in the cast and seen recently Off Broadway in both The Spoils and Bad Jews) conveys a great deal with his brooding silences. When A View from the Bridge is over, the audience knows that it has participated in a communal act of catharsis. While Death of a Salesman is often described as the modern equivalent of Greek tragedy, this production demonstrates without a doubt that this is what Arthur Miller was attempting in A View from the Bridge and has succeeded completely.